The second instalment of the blog series based on our Smart Cities in Europe report explores the obstacles created by lack of funding, and potential solutions to enable the realisation of smart cities in Europe. Our survey data reveals a number of obstacles that need to be overcome for smart city initiatives to be implemented faster and more widely. Perhaps the most significant finding was that obstacles vary depending on the type of smart initiative. For smart meters, survey respondents identified social obstacles – the lack of consumer demand for solutions and concerns over security and privacy – as the two most important obstacles to their more rapid and widespread roll-out. However, for energy storage, survey respondents identified a lack of proven and/or adequate technology as the most significant obstacle. A lack of consumer demand was highlighted as the greatest obstacle to the adoption of building control systems, while a lack of finance, government incentives and outdated legacy urban infrastructure were selected as equally important obstacles to the adoption of intelligent transport systems. A lack of funding is the major obstacle to the realisation of smart cities in Europe. (Click to Tweet). Survey respondents identified it as the number-one obstacle to the roll-out of intelligent transport systems, the second most important obstacle to the implementation of energy storage and the third most important obstacle to the wider use of building control systems. Both private-sector companies and local government authorities that might want to invest in the roll-out of smart city infrastructure are facing financial difficulty. Local authorities across much of Europe are more focused on balancing budgets than making sizeable investments. In this context, many local authorities must focus all their resources on providing basic public services rather than new, innovative and sometimes untested smart city initiatives where the net benefit is sometimes hard to measure. So where could funding come from? 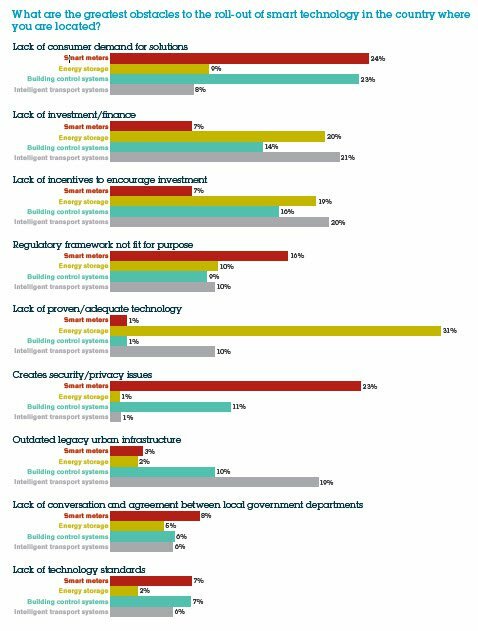 Survey respondents identify government institutions as essential in unlocking investment in smart infrastructure programmes — over 70% of survey respondents predict that government institutions will be the most active investors in smart city infrastructure programmes in the next three years. Half of respondents expect direct procurement of smart solutions to be the most common source of investment in smart infrastructure programmes, 16% expect government-backed funds to be the most common source of investment, while 6% expect government grants to be the biggest source of funding. Some governments are further ahead than others in investing in smart city infrastructure. For example, the UK Government is investing directly in building energy efficiency through the Green Deal initiative. Through the initiative the Government provides loans to homeowners to fund the purchase and installation of energy efficiency systems such as efficient boilers, cavity wall insulation or double glazing. Importantly for homeowners, the loan is repaid from the savings generated from lower energy bills. The sum of loan repayments and the new lower energy bills are capped at the level of previous energy bills, meaning there is no net cost to homeowners. 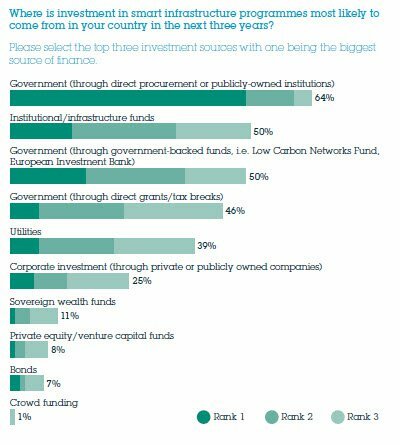 The predicted reliance on government funding during the next three years makes sense given the lack of smart infrastructure programmes that have been rolled out in Europe. The shortage of successful examples means that private-sector investors are still uncomfortable with committing capital to the sector. As more smart city infrastructure programmes are rolled out, interest from the private sector should change. While government funding is expected to be the largest source of funding during the next three years, survey respondents indicate that some of the most effective funding structures involve the private sector. The most effective type of financing used to fund smart infrastructure programmes varies depending on the type of infrastructure being financed. 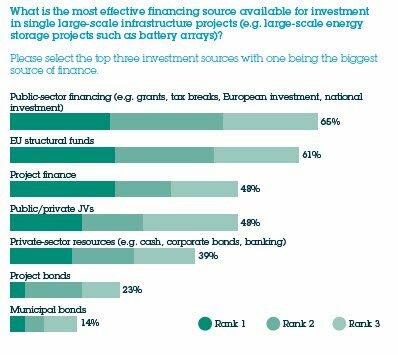 For single large-scale smart city infrastructure, such as an energy storage facility or a distributed renewable energy generation project, survey respondents identified public sector financing, EU structural funds and project finance as the most effective sources of financing. However, for smart infrastructure programmes involving the roll-out of hundreds of thousands of small smart city components, such as smart meters, building control systems or vehicle to infrastructure sensors, survey respondents identified public-sector financing and private-sector resources as the most effective financing sources. To entice investment from the private sector into smart city infrastructure, infrastructure developers and building owners must offer financing structures that provide an adequate risk-reward proposition. 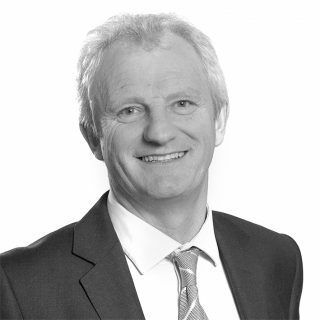 Survey respondents believe project finance structures, where the procurement, installation or construction of smart infrastructure is funded using a combination of debt and equity on a non-recourse basis, are most likely to provide this – the majority (70%) of survey respondents expect project finance structures will be used to fund the roll-out of smart technology in the next three years. While project finance structures have been used extensively to fund construction of infrastructure such as renewable energy projects for many years, thus far it has not been used widely to fund the roll-out of smart infrastructure such as energy efficiency equipment. If providers of energy efficiency solutions can guarantee that the installation of efficiency equipment will result in energy savings through energy performance contracts, then investors may be able to commit to funding the installation of such equipment with a contract in place that obliges the building owner to repay investors with a portion of the savings generated from lower energy bills. 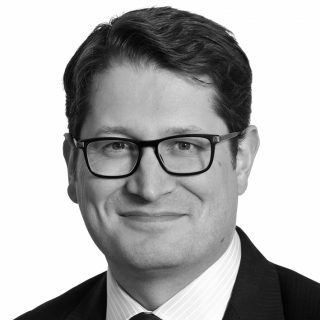 However, as David Ferris, Partner at Osborne Clarke, explains, there are inherent difficulties in using project finance for energy efficiency infrastructure. “The thing banks like so much about project finance in renewables projects is the income stream from the subsidy and revenue from the sale of the energy,” he said. Despite the challenges, this structure is increasingly being utilised across Europe. For example, in July 2014, the London Energy Efficiency Fund reached financial close on a £12 million loan for St George’s Hospital in London. The loan will finance the installation of energy efficiency technology at the hospital, which is expected to reduce energy costs by 25% while cutting 6,000 tonnes of carbon emissions annually. (Click to Tweet). Equipment installed includes combined heat and power boilers, solar panels and absorption chillers. A number of modifications to the set-up of the heating, ventilation and air-conditioning systems have also been made. Underpinning the loan is an energy performance contract provided by British Gas guaranteeing a certain level of energy savings. The energy performance contract is expected to deliver net savings of over £1 million per annum. This transaction demonstrates how a well structured energy performance guarantee can create an investable proposition. 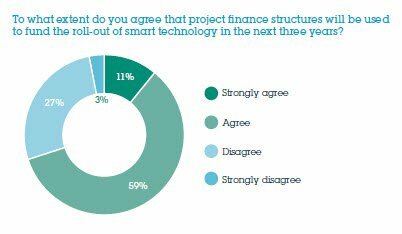 Aside from project finance, survey respondents have little confidence that alternative funding structures such bonds will be effective in attracting capital to smart city infrastructure projects. 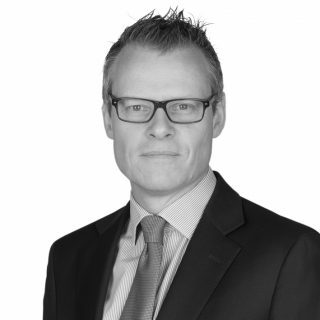 Given the inherent difficulties in structuring project finance transactions for smart city infrastructure, city planners, fund managers, banks and technology companies need to work together to identify new funding models that create an adequate risk-reward proposition for investors. 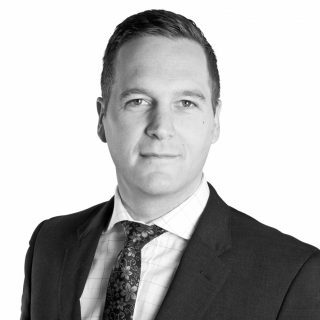 As David Ferris, Partner at Osborne Clarke explains, collaboration is essential to create new financing structures. 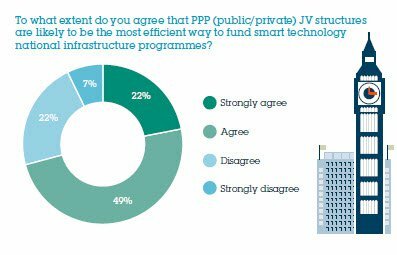 Whatever financing structure is used, our survey data reveals it is vital for the public and private sectors to collaborate on financing smart infrastructure – 71% of survey respondents believe PPP (public/private) JV structures are likely to be the most efficient way to fund smart technology infrastructure programmes over the next three years. One way to encourage the public sector to invest in smart city infrastructure is to demonstrate the return on investment (beyond the benefits of the initiative itself) by exporting local knowledge and technological expertise to other cities, both domestically and internationally. Thus far France is leading the way through exports to India – in October 2014 the French Ambassador to India announced that the French Government is in discussions with the north Indian state of Himachal Pradesh to provide investment and expertise to assist in the development of smart cities across the state.